Our horn supplies are sourced ethically from renewable resources in Vietnam. 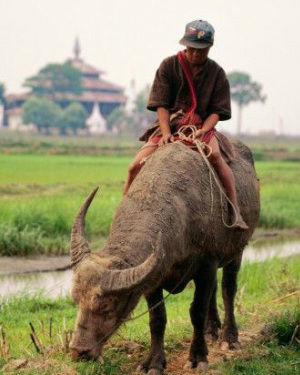 The water buffalo, or Asian buffalo, as it is often called, have been domesticated for more than 5,000 years. They have buttressed humanity's survival with their meat, horns, hides, milk, butterfat, and powder, ploughing and transporting people and crops. When given a high polish buffalo horn develops an extremely hard surface and has to be one of the toughest natural materials used for the table for thousands of years. Care: Please do not expose horn to long periods of extreme temperatures, wash by hand and not put into the dish water. Can be waxed after use to maintain healthy.